(CNN) -- Mark Cavendish, the fastest sprinter in cycling, has exclusively told CNN that he is not concerned about claiming the sprinter's green jersey at the Tour de France. Briton Cavendish continues to prove the man to beat in the sprint stages of major races. Cavendish won four stages in last year's Tour, and is a hot favorite to pick up at least the same number of stage victories this season. However, the Briton has failed to finish his only two previous Tours -- and he will need to get all the way to Paris in order to have a say in the prestigious green jersey -- awarded to the most consistent rider, normally a sprinter, in the race. 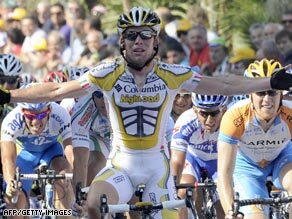 Cavendish told CNN: "I haven't reached Paris yet and I want to, because I want to win on the Champs-Elysees. It's a lot to ask to match last year's four stage wins, but every sprint stage I'll be going out to give 100 per cent. "But the green jersey is not a target for me. It's something that may happen as a result of my stage wins but I won't be disappointed if I don't have the green this year. But it is achievable for me and would be a nice bonus." Cavendish also told CNN that he was delighted to see Lance Armstrong back in the peloton, with the American aiming to claim his eighth Tour de France victory. "For Lance Armstrong, there is only one race that counts -- and that is the Tour de France. "You can see throughout the year that he has been getting better and better with each race. I know how driven Lance is, because his drive is very similar to mine. "Lance is so talented that he can win this time. It will be a remarkable thing. He has been four years out of the sport but to come back and be as competitive as he is shows just what a talent he is."